They give your feet the killer instinct. Puma athletic shoes are a different breed. Pros prize them for their light weight and the features that give athletes the moves and confidence of a big cat. They’re built wider (like a cat’s foot) for cat-like spring and turn-on-a-dime agility. 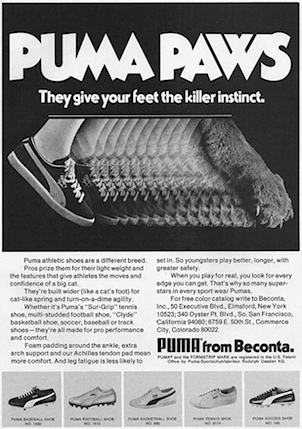 Whether it’s Puma’s “Sur-Grip” tennis shoe, multi-studded football shoe, “Clyde” basketball shoe, soccer, baseball or track shoes – they’re all made for pro performance and comfort. set in. So youngsters play better, longer, with greater safety. When you play for real, you look for every edge you can get. That’s why so many super-stars in every sport wear Pumas. Office by Puma-Sportschuhfabriken Rudolfh Dassler KG.